The enviable location of Mount Sinai makes Glentrees a sought-after residence in the prestigious district 10. At the centre of many premier schools, tertiary institutions and local shopping centres and being within easy reach of the Buona Vista MRT, Science Park and the future One-North, Glentrees is the perfect choice of an ideal home with good investment potential. Glentrees is situated in the centre of nearby tertiary institutions like the National University of Singapore, Ngee Ann Polytechnic and INSEAD. Henry Park Primary School, Fairfield Methodist Primary School, Anglo-Chinese School (Independent), Chinese High School are within the vicinity of Glentrees. Shopping is made convenient within the neighbourhood by Cold Storage Jelita, Turf City and Holland Village shopping area. The Dover and Buona Vista MRT stations are within easy reach of Glentrees. Outdoor and recreational pursuits are satisfied with well-stocked features within Glentrees. There is a 50m lap pool, Jacuzzi, Water play area, Sundeck, Clubhouse, Fitness Corner and indoor gym. The frontier of Garden Homes, every unit at Glentrees is provided with a private enclosed space, open terrace or planter box for you to create your own nature corner. 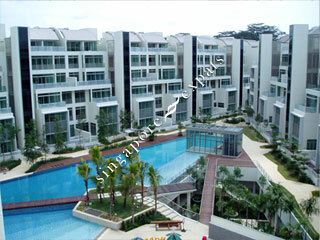 There are three kind of layouts to choose from, namely the Garden Terrace (Townhouse), Garden Apartment and Garden Loft.